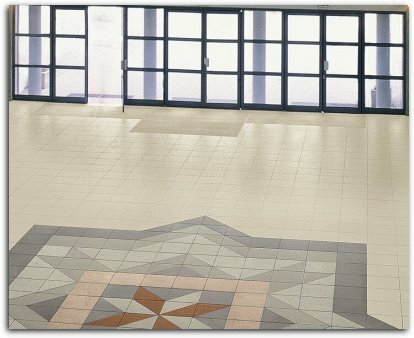 Unglazed tile floors are fire-hardened clay tile with color running throughout and a matte-type surface finish. Unglazed tile's appearance does not change as the tiles wear, and they generally are not as slippery as glazed tile flooring. They are available in many shapes, colors, and designs, and cleaning requires only occasional mopping. When occasional maintenance is needed, simply vacuum to remove gritty particles. You can also damp mop or sponge with water and/or a diluted solution of water and "soapless" detergent. For a more thorough cleaning, use a scouring powder paste. Let stand for five minutes, then scour with brush. Rinse and wipe dry. A small brush is suitable for small floors, consider a scrubbing machine for larger areas. For more information on this and other natural stone flooring products... FloorBiz is your starting point to all the important unglazed tile flooring sites on the internet.